[CalArts] – The Princess Grace Foundation just announced its 2012 awards and CalArtians Nijla Mumin (MFA-2, Film Directing, Writing), Vincent Richards (MFA-3, Scenic Design) and alumna Miwa Matreyek, (MFA 07, Experimental Animation) are among the honorees. They will receive their awards at the 30th Anniversary Princess Grace Awards Gala, held in the presence of TSH The Prince and Princess of Monaco, on October 22, in New York City. The Awards for theater, dance and choreography, and film continue the legacy of Princess Grace of Monaco, who helped emerging artists pursue their artistic goals during her lifetime. Since the Foundation’s inception, more than 750 Awards, totaling more than $9.5 million have been made. Over the last 10 years, 23 Calartians have received Princess Grace Awards—with several recognized on multiple occasions. This year marks the third award for Miwa who is receiving a Special Project Award for her groundbreaking (and delightful) work in experimental animation and performance. Other three-time CalArtian awardees include filmmakers Karolina Sobecka and David Chaim Cohen, theater director and media artist Chi-Wang Yang and choreographer Dawn Marie Stoppiello. 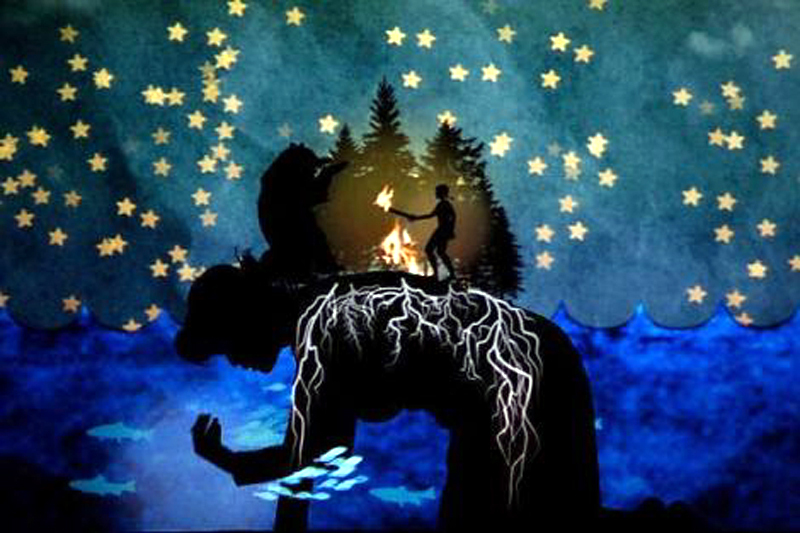 Princess Grace Award recipient Miwa Matreyek’s Myth and Infrastructure at REDCAT’s New Original Works (NOW) Festival in 2010. NEW YORK, NY (August 7, 2012) – The Princess Grace Foundation-USA (PGF-USA) and its Chairman, Hon. John F. Lehman, announced today the winners of the 2012 Princess Grace Awards. The Awards for theater, dance and choreography, and film continue the legacy of Princess Grace (Kelly) of Monaco, who helped emerging artists pursue their artistic goals during Her lifetime. This year’s 25 Awards winners will travel to New York City, where they will receive their Awards at the 30th Anniversary Princess Grace Awards Gala, held in the presence of TSH The Prince and Princess of Monaco, on October 22, 2012 at Cipriani 42nd Street. PGF-USA is also proud to announce the inaugural year of the Princess Grace JustFilms Documentary Awards, made possible by the Ford Foundation’s JustFilms program. These funds support social justice documentary film projects, which focus on South Asian and Southeast Asian communities. The Princess Grace Foundation-USA, a public charity, was formed after the death of Princess Grace in 1982. They present scholarships, apprenticeships, and fellowships to assist artists at the start of their careers. The Foundation has cultivated a diverse group of nearly 600 artists to date who continue to advance the spectrum of performing arts with innovative, cutting-edge, and vibrant theater, dance, choreography, film, playwriting and design. Since the Foundation’s inception, more than 750 Awards have been given to recipients, totaling more than $9.5 million. For the fourth year in a row, celebrated artist Alex Soldier, known for his mastery of precious miniatures, has created an objet d’art to symbolize the Princess Grace Awards. The Award symbolically combines the three art forms lauded by the Foundation: theater, dance, and film by using precious metals and Swarovski crystal accents. The sculpture is made for each recipient to wear as a pin, a special reminder of their Award for the world to see. Past winners of the Awards who distinguish themselves in their artistic disciplines since receiving their initial Princess Grace Awards are eligible to win the coveted Princess Grace Statue Award. It includes a $25,000 unrestricted cash gift and a special Bronze Statue of Princess Grace created by Dutch artist Kees Verkade. This year’s Statue Award winners are Patrick Page and Darron L West. The Princess Grace Foundation-USA is a not-for-profit, publicly-supported foundation, headquartered in New York City and founded 30 years ago by Prince Rainier III of Monaco in honor of his wife, Princess Grace [Kelly]. The Foundation’s mission, that mirrors Princess Grace’s in Her lifetime, is to support emerging artists in theater, dance and film through the awarding of scholarships, apprenticeships and fellowships. Since the Foundation’s inception, more than 750 Awards have been given to recipients, totaling more than $9.5 million. Some notable Princess Grace Awards recipients in Film include: Cary Joji Fukunaga, director of Sin Nombre and Jane Eyre; Stephen Hillenburg, creator of SpongeBob SquarePants and Greg Mottola, director of Paul, Adventureland and Superbad. Theater recipients include: 2008 Tony® Award winner for Best Direction of a Play, Anna D. Shapiro; Pulitzer and Tony® Award winning playwright Tony Kushner; and 2006 Academy Award® winner Eric Simonson. Dance/Choreography recipients include: Alvin Ailey American Dance Theater Artistic Director Robert Battle; American Ballet Theatre’s Gillian Murphy, Isabella Boylston and Sarah Lane; as well as choreographers Kyle Abraham and Camille A. Brown.